Geo Hazards | GReD - Geomatics Research & Development s.r.l. Geological, geotechnical and hydrological phenomena such as subsidence, landslides, heavy rain and consequent floods, are happening at an increasing rate, also due to extreme events likely to be driven by climate change. These phenomena govern negative and sometimes destructive impacts on land, structures (dams, bridges, buildings), infrastructures (roads, railways, channels, pipelines, energy network, etc), and ancient structures of artistic and cultural value (churches, ruins, archaeological sites, etc). 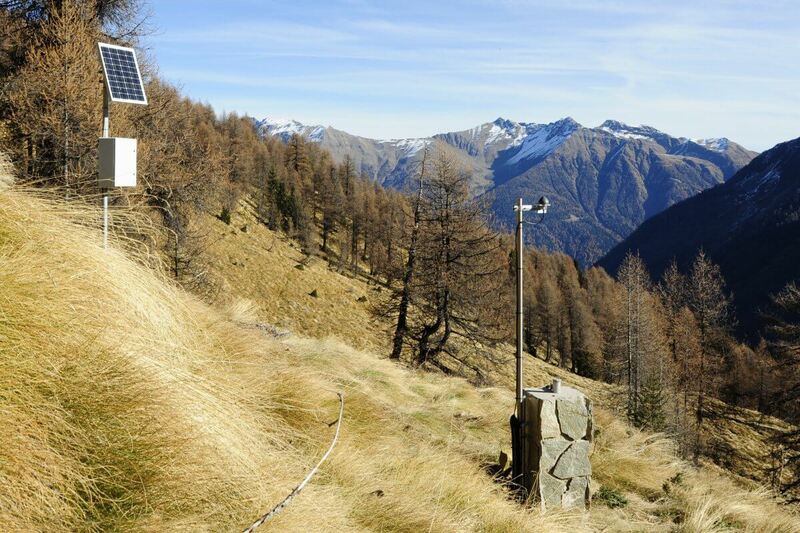 The sensitivity to different hazards of many areas in Italy, Europe, as well as around the world, puts forward the need for an integrated and cost-effective geodetic monitoring capability. In general, the purpose is to have detailed and timely knowledge of the geophysical behaviour of parts of the Earth surface, and its hindrances on urbanized areas, in order to mitigate casualties and injuries to the population, and better plan maintenance intervention. Sensors are deployed in the area of interest, and their data are processed by GReD own software to quantify the physical quantity to be monitored. The sensors are based on GNSS technology. While standard GNSS stations are typically quite expensive, GReD has developed, in collaboration with Softeco, a proprietary cost-efficient solution which allows deploying a higher number of monitoring points, thus providing more comprehensive measurements within the area of interest. The data processing engine developed by GReD guarantees state-of-the-art results, with the additional benefit of innovative solutions based on the continuous R&D activities carried out by GReD researchers. 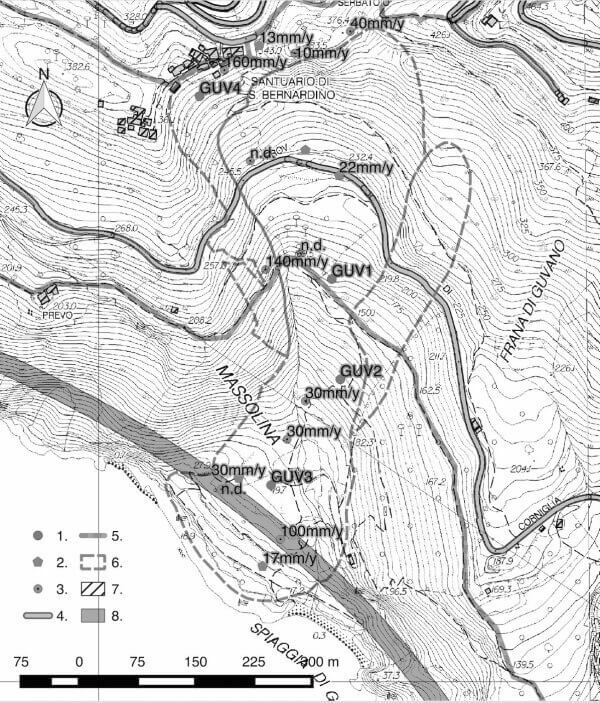 The deployment of GNSS stations at key points on the landslide body allows for a continuous, precise monitoring of their displacements. Daily solutions to monitor the slower motions with the highest precision, hourly solutions to detect the faster movements. Continuous and precise monitoring of the long-term displacements associated with subsidence/uplift phenomena. The use of cost-effective GNSS stations allows for the deployment of a higher number of monitoring points, facilitating a comprehensive understanding of the deformation patterns over the whole area of interest. GNSS stations are used to estimate the integrated amount of water vapor in the atmosphere. Variations of water vapor in time and space are monitored by deploying a number of cost-effective stations in the area of interest. GNSS-derived water vapor data can then be assimilated into numerical weather prediction models to improve the forecast of rain events. The San Bernardino-Guvano landslide is one of the wider slope mass movements located along the eastern Ligurian coast between Vernazza and Corniglia, Cinque Terre National Park, Italy. It is an ancient and complex landslide that has been studied since 1853, when a catastrophic event occurred. Both geological and geomorphological field surveys supported by remote-sensing were carried out, as well as bibliographical research about past geotechnical investigations and topographical monitoring; continuous displacement monitoring of four sites within the landslide mass started in October 2015, by means of GReD’s GeoGuard service, and it’s still ongoing. The measured displacement rates show a good spatial heterogeneity. Gradients of displacement rates are observed in the north-south and east-west directions. The displacement rates increase from early-mid June to early July. In 2017, higher displacement rates are recorded in the lower part of the landslide than on the upper side. The displacement field (figure below) agrees with previous knowledge dated 2003-2004, when a horizontal gradient of displacement rates and velocities close to 30mm/year was measured.